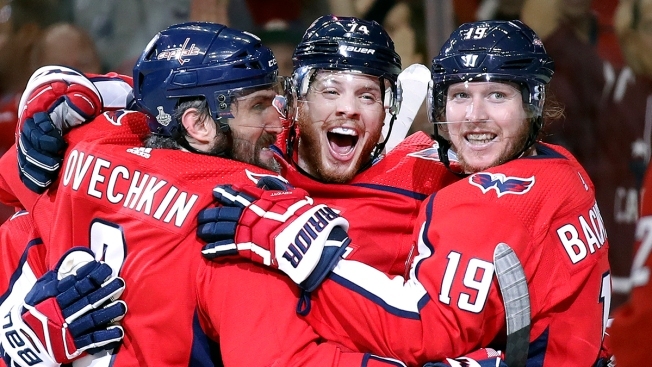 Washington Capitals defenseman John Carlson, center, celebrates his goal against the Vegas Golden Knights with Alex Ovechkin, left, of Russia, and Nicklas Backstrom, right, of Sweden, during the second period in Game 4 of the NHL Stanley Cup Final, Monday, June 4, 2018, in Washington, D.C.
That's not necessary for the 28-year-old who has made the Washington area his home and wanted to stay if there was a fit. The Capitals got the cap space necessary to re-sign Carlson by trading veteran defenseman Brooks Orpik and backup goaltender Philipp Grubauer on Friday night at the NHL draft. Carlson has been a mainstay on the Capitals' blue line since 2010-11. The 2008 first-round pick has 333 points in 608 regular-season games and 55 points in 100 playoff games. Re-signing Carlson was just the first move on MacLellan's summer checklist. He's attempting to re-sign trade-deadline pickup Michal Kempny before Carlson's defense partner can become an unrestricted free agent July 1, and he needs to negotiate new contracts for restricted free agent forwards Tom Wilson and Devante Smith-Pelly. There's also the matter of replacing Barry Trotz as coach after he resigned and joined the New York Islanders. Associate coach Todd Reirden, who was a finalist for the Flames' head job two years ago, is the heavy front-runner, though MacLellan wanted to sit down and formally interview him this week first.